The first of three core rulebooks for the 4th Edition "Dungeons & Dragons"(R) "Roleplaying Game," The "Dungeons & Dragons"" Roleplaying Game" has defined the medieval fantasy genre and the tabletop RPG industry for more than 30 years. In the D&D game, players create characters that band together to explore dungeons, slay monsters, and find treasure. 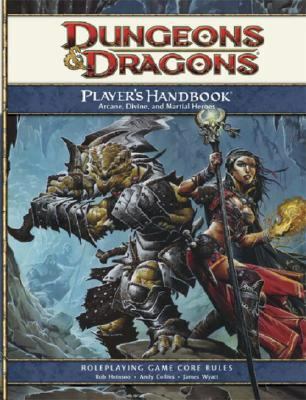 The 4th Edition D&D rules offer the best possible play experience by presenting exciting character options, an elegant and robust rules system, and handy storytelling tools for the Dungeon Master. The "Player's Handbook" presents the official "Dungeons & Dragons"" Roleplaying Game" rules as well as everything a player needs to create D&D characters worthy of song and legend: new character races, base classes, paragon paths, epic destinies, powers, more magic items, weapons, armor, and much more.Heinsoo, Rob is the author of 'Dungeons & Dragons', published 2008 under ISBN 9780786948673 and ISBN 0786948671. Loading marketplace prices 42 copies from $1.50 How does the rental process work?